The 2017 East-West Shrine Game has some notable names on the rosters. The East-West Shrine Game is the first college post-season all-star game of the year. The game has been played since 1925 and features some of the best college seniors. Annually the game is attended by NFL scouts looking to find a potential late round draft steal. The 2017 rosters can be found here. Here are some of the players to watch for, during the East-West game on January 21. 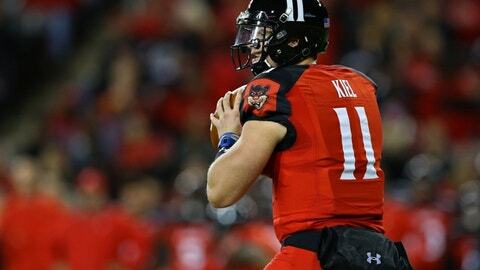 Gunner Kiel is the biggest name quarterback on the west roster. Kiel was highly recruited coming out of high school. After originally committing to LSU and Indiana, Kiel enrolled at Notre Dame. After struggling to get on the field for the Irish, Kiel transferred to Cincinnati. Kiel started for Cincinnati during the 2014 and 2015 seasons. But curiously was named the third-string quarterback entering the 2016 season. Partway through the season Kiel regained his starting role. Trey Griffey is the son of Baseball Hall of Famer Ken Griffey Jr. Griffey played college football at Arizona. In his senior season, Griffey caught 23 passes for 382 yards. For his career, Griffey had 79 receptions, 1,241 yards and six touchdowns. The Seattle Mariners drafted Trey Griffey in the 24th round of the MLB draft to honor his father. Jeremy Cutrer was named first-team All Conference USA at Middle Tennessee State. The 6-foot-2 corner could be a player to watch in the late rounds of the NFL draft. Cutrer finished the season with 57 tackles and three interceptions. Kermit Whitfield was a return specialist during his career at Florida State. As a freshman, Whitfield returned kickoffs and average of 36.4 yards. Florida State looked for different ways to get the ball in the hands of the 5-foot-8 speedster. As a receiver, Whitfield had 96 receptions, 1282 receiving yards and 12 career touchdowns. Ejuan Price is a pass rushing prospect from Pittsburgh. In his senior season, Price recorded 13 sacks, 21 tackles for a loss and 13 quarterback hurries. Price’s ability to get into the backfield will surely attract the attention of several NFL scouts.